The Daily GRRR! HEADLINES for March 12th, 2015. 1. No Tar Sands Transport Without Consent in Treaty 3 Territories. 2. Additional Research Shows Union Busting leads to Economic Inequality. 3. Bill C51 Opposition Grows As Hearings Set To Begin. 4. ”It’s a sad day” - Todd Serious of the Rebel Spell Dies in Nevada Rock Climbing Accident. Welcome, I am your host dan kellar and you are listening to The Daily GRRR! on 100.3fm, CKMS in Waterloo, Ontario. Soundfm.ca on the web, today is March 12th, 2015. The music that opened the show was from The Rebel Spell’s tune The Tsilhqot'in War. Stating in a declaration “We are joined to Declare to our Nation, as the political leadership we are determined to ensure that no oil or bitumen shall be transported through Anishinaabe Aki without our full, prior and informed consent,” chiefs from the Anishinaabe Treaty 3 First Nation unanimously shared their opposition to tar sands oil shipments through their territory. Treaty 3 First Nation comprises twenty-five Anishinaabe First Nations. Some Treaty chiefs were not able to attend the two-day special assembly last week, but there appears to have been no disagreement among the chiefs present on endorsing the declaration. Aimed primarily at the proposed energy east pipeline from transcanada corporation, the declaration could spark wider impacts on operational plans for other export pipelines, such as southern Ontario’s #Line9, which are fed through western pipelines. More research has been released showing that income equality is shredded as union membership declines, which re-enforces earlier data which showed that in countries with strong union membership and collective bargaining power there are lower rates of poverty. While the impact on the middle class is highlighted in the article, it is working class people who feel the most severe impacts from income inequality. Opposition to Canada’s conservative government’s bill c51, Harper’s so-called “anti-terror” legislation, continues to grow with a country wide day-of-protest planned on saturday March 14th. The legislation has been accurately and widely condemned within canadian social justice circles, academic and legal communities, and civil liberties watch dogs as unconstitutional through its regularisation of spying and infiltration; fascistic in its de-facto creation of an secret police; and intrusive with a normalisation of restrictions to civil liberties. And we end our headlines on a sad note today as we pass along news of the tragic sudden death of Todd Serious, the 41 year-old lead singer of Vancouver/Lillooet based The Rebel Spell. In a write up for the Georgia Straight, Allan MacInnis wrote that Serious was “one of the most articulate and passionate members of the Vancouver punk scene” and adds the death occurred as Todd was climbing with his brother in Black Velvet Canyon, Nevada. “A long-time rock climber, Serious was no stranger to the hazards of the sport, and performed at Adstock in Maple Ridge just last summer with back problems caused by a previous fall. Serious's lyrics reveal a commitment to social justice, First Nations sovereignty, and animal rights. It wouldn’t be a bad epitaph. 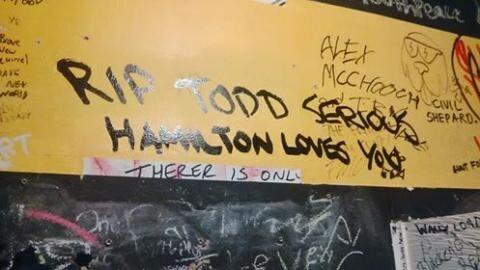 Messages honouring Todd were also flowing in europe. “Expect Resistance would like to extend our condolences to Todd's family, friends, band mates, and loved ones. We didn't know Todd, but we had the pleasure of opening for The Rebel Spell in Kitchener on their Last Run Tour. Great music with an amazing message. Personally, The Rebel Spell’s music and message inspired and energised me and was a major part of the Daily GRRR! and AW@L radio soundtracks over the past several years. Todd’s good nature and welcoming attitude showcased the very best punk has to offer. As i fondly remember the ear-drum shattering opening of the KWCCSJ in 2009, i think to the bands most recent show in Kitchener in 2014 which i was able to catch only because my second child delayed arriving in this world for an extra day. I send my condolences to Todd’s family, friends, and bandmates. I Heard you Singing Todd, Rest in Power! Thats all for headlines, lets take a little break and go to a song, here is Rebel Time Randy’s request for a tune from The Rebel Spell, this is Fight For The Sun off of their 2014 album “Last Run”. And we are back, you just heard The Rebel Spell with Fight For The Sun. Again Todd Serious of The Rebel Spell, dead at 41 following a rock climbing fall on March 7th. You are listening to the The Daily GRRR! Today is March 12th, 2015 and my name is dan kellar and we are now moving into the feature portion of our broadcast.